Fat is a very popular treatment modality in Regenerative Medicine. There have been many articles written about fat some condemning it as being far inferior to bone marrow aspirate while others give it the highest praise. The real question is, "Where does fat (adipose tissue) lie on the Regenerative Medicine spectrum?" Like many aspects in an emerging field, the studies need to be scrutinized further. Are some of the studies flawed or is there a missing component giving rise to the diversity of results? One of the issues giving rise to problems is that many of the studies need to be more definitive because they are not necessarily comparing like with like. By this I mean we need a classification concerning the source of the adipose tissue. We are not just talking about the age of the patient, the location of the tissue, but also the patient’s lean body mass. The question we need to address is this; "Is all fat created equal or is there a major difference between patients having a different body habitus?" The following two diagrams succinctly demonstrate the differences in the cell content of adipose tissue between a lean and an obese patient. These two diagrams speak volumes concerning fat cells in patients. We have known for some time that one of the major differences between obese and lean people is that the fat cells differ in size. The lean person has more cells per CC than the obese person. If one gains weight, the cells do not grow in number but increase in size. The opposite is true when one loses weight. The number of fat cells in the body is relatively constant. If a liposuction is performed, then those cells are lost forever. Typically, there is no replacing them. The differences between obese and lean people goes far beyond just the number of cells. Adipose tissue is a source of many different cells including stem cells and other regenerative cells. Remember nature works as a symphony. It utilizes many different types of cells to achieve repair (not just stem cells). 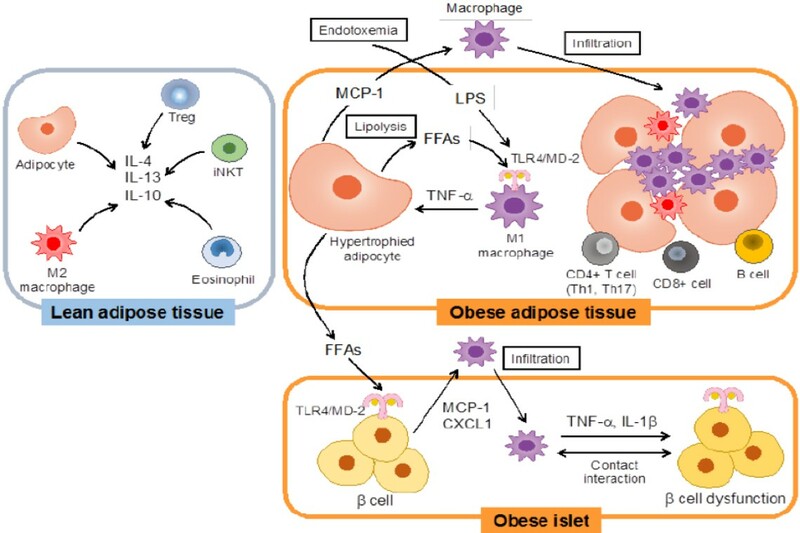 If adipose tissue is a source of stem cells, then logic would say that the more obese a person is, the healthier they should be since overall, they have more stem cells which are available. This is where the logic falls down. Why is it that an obese person who has belly fat has a propensity for diabetes and other diseases including an increased incidence of cancer? The answer lies in the cell profiles. The obese patient has many more inflammatory cells. The inflammation caused by these cells leads to many medical problems. We now know that the cell profiles determine what the health of the patient might be. We look at the cell profiles in the above diagrams and can observe a significant difference in cell types. Let us break this down further. In the second [lower] part of the diagram, we see that, in the lean adipose tissue, anti-inflammatory cells far exceed the number of pro-inflammatory cells. In the obese patient the opposite scenario pertains. Taking one cell type at a time, we see the first cell to discuss is the iNKT cell. An iNKT is a type of Natural Killer T Cell (NKT). NKT cells are a heterogeneous group of T cells that share properties of both T cells and natural killer cells. NKT cells seem to be essential for several aspects of immunity because their dysfunction or deficiency has been shown to lead to the development of autoimmune diseases (such as diabetes or atherosclerosis) and cancers. They help produce a number of cytokine growth factors which help to suppress inflammation. Thus, we can see they are intimately involved in our immune system. Our immune system and stem cells are intimately intertwined. Lean fat has larger numbers of these cells compared to obese fat. The second big difference between lean and obese fat is the in the number of M-2 macrophages. Macrophages are one of the white blood cells of the immune system. Depending upon the cell neighborhood, they can either cause inflammation or reduce it. Macrophages are found in two different activated forms called M-1 and M-2 macrophages as can be seen below. 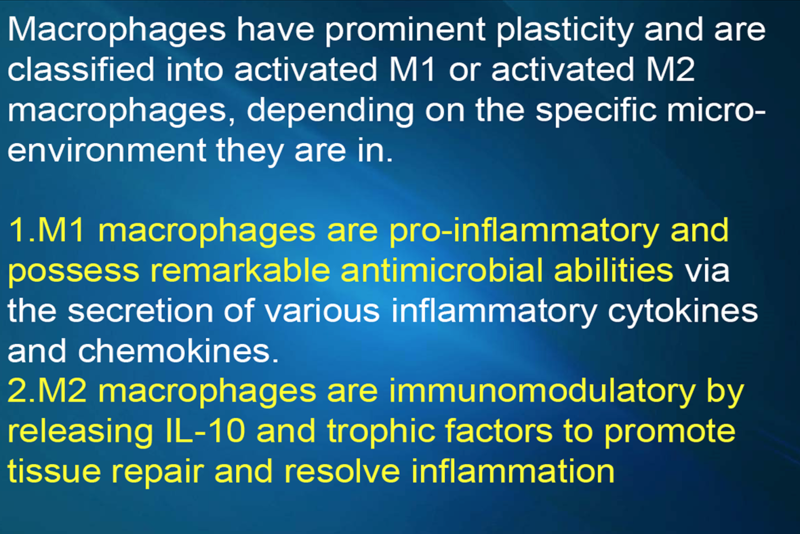 The M-1 macrophages are macrophages which have many different names. Some people call them killer macrophages. The above diagram refers to them as the "dark side". This is not necessarily a true identity for the M-1 macrophage. Under the right circumstances, they can save our lives by destroying invading bacteria. They are excellent in killing bacteria etc. but can cause tissue injury. 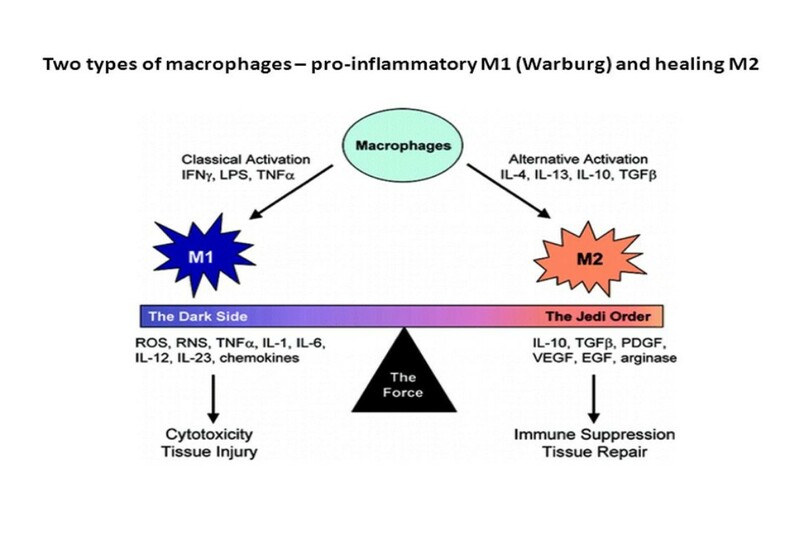 The destroying of tissue is the dark side is the M-1 macrophage. Unfortunately, the inflammation is not always discriminatory. For regenerative purposes, the M-1 macrophage is not our friend. The M-2 macrophage belongs to the "Jedi Order". The M-2 macrophage is instrumental in causing tissue repair. The "Repair" designation broadly refers to macrophages that function in constructive processes like wound healing and tissue repair, and they turn off damaging immune system activation by producing anti-inflammatory cytokines like IL-10 and TGF-beta. I liken IL-10 to the body's cortisone with no baggage. It is one of the body's master anti-inflammatory cytokines. In addition to fat tissue, these macrophages are also found in PRP and bone marrow aspirate. The following is a good summation of M-1 and M-2 macrophages. Another cell which is very important in the adipose profile is called a Treg cell. The regulatory T cells are a subpopulation of T cells that modulate the immune system, maintain tolerance to self-antigens, and prevent autoimmune diseases. Tregs are immunosuppressive and generally suppress or downregulate induction and proliferation of effector T cells. T cells can cause an inflammatory response. They are responsible for many autoimmune diseases. Recent research has found that the cytokine TGF-beta is essential for Tregs to differentiate from naïve CD4+ cells and is important in maintaining Treg cells. The bottom line is that Treg cells help protect the body from various autoimmune diseases such as Rheumatoid Arthritis, Multiple Sclerosis, Diabetes, and a host of other diseases. Now we can see the reason why there is interest in studying adipose in the possible treatment of autoimmune diseases. The Treg cells can also be instrumental in repair. A source of Treg cells along with M-2 macrophages can be a potential weapon in the treatment of autoimmune diseases. In addition to adipose tissue, bone marrow aspirate also contains large numbers of Treg cells. Is there a method that would allow us to change the profile of the fat cells? 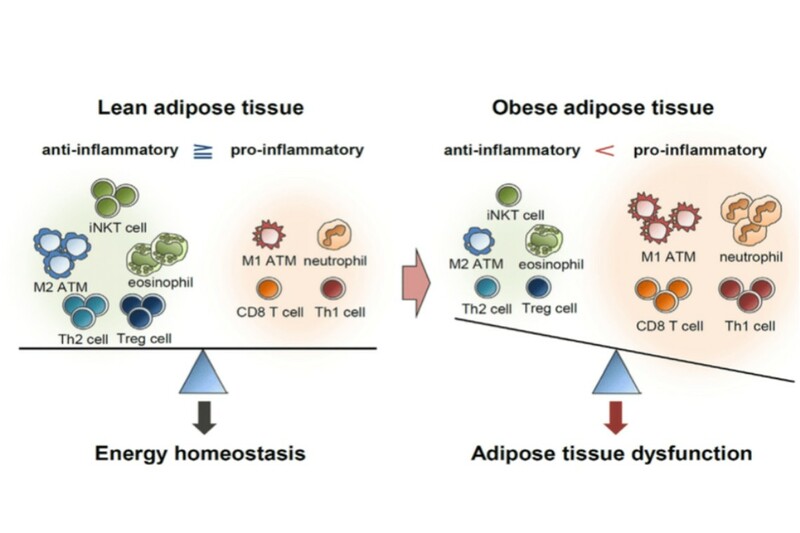 Can we make obese adipose tissue behave more like lean adipose tissue? Can we change the cell profile to have more cells which will help in repair process? Can we make these cells more effective for autoimmune diseases? These are very intriguing questions. It appears that the answer to each of these questions is "yes" and it can be done by changing the environment of the cells. In other words, change the cytokines the cells are exposed to. Changing the environment of the cells is easier said than done. Some of this can be achieved through the use of supplements (such as Nitric Oxide generators and Curcumin) which may help improve the environment of the cells. A greater method of improving the cell profile may be accomplished by Cytokine Therapy. Cytokines are signaling proteins that are produced by white blood cells and stem cells. They help mediate and regulate immune responses, inflammation, and repair. With the addition of certain growth factors, we can cause a preponderance of let us say M-2 macrophages and Treg cells while at the same time suppressing other types of cells which lead to inflammation. In so doing, we are pointing the adipose tissue towards repair. When looking at these cell profiles and adipose in general, there are many advocates of using fat sources after they are broken down into more of their component parts. This is typically done by using an enzyme and the separated product is called the stromal vascular fraction. In summary, significantly differing results will arise, depending on the nature of the fat being harvested and the extent of any compensatory measures taken in the case of obese patients. This may have led to some of the variability in results measured in different trials. Whilst a lean patient’s adipose tissue may offer more benefits, that is not to say that fat from an obese person cannot also be made to yield good results.